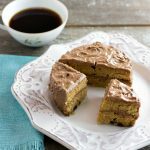 2 Minute Chocolate Peanut Butter Mini Cake Low Carb is a grain free, gluten free, and paleo, small, nut butter layer cake with chocolate chips and a chocolate nut butter frosting. All this deliciousness can be made in an amazing two minutes! Course: and low carb, and paleo version. Add 1 ½ tbsp melted butter or coconut oil to a 7 to 8 inch (16 to 32 ounce ramekin or glass bowl)* see video. Add 1 tbsp heavy cream or unsweetened coconut milk, ¼ tsp vanilla extract, one large egg and 1 ½ tbsp peanut butter or almond butter. Mix or whisk together thoroughly. Add ¼ tsp baking soda and ½ tsp apple cider vinegar and mix together. Stir in optional 1 tbsp chocolate chips (sugar free kind or paleo brand). Remove and set aside to let cake cool. In a small bowl combine all the frosting ingredients and mix together. Set aside. Loosen cake from ramekin by sliding a knife around sides of cake. Dump ramekin over onto a plate *see video above. Turn cake up on its side and slice in half (like an English muffin). Frost the top of one half of cake. Stack other half of cake on top of frosted half. Frost the top and sides of cake. Slice in half and then in fourths. Serve.